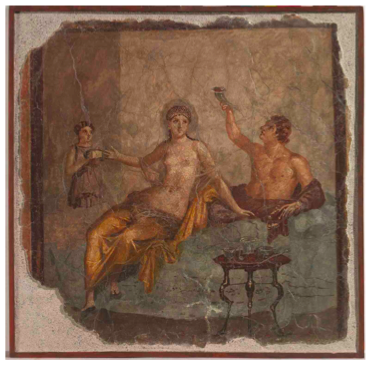 I developed this course as part of my training at the Sheridan Center for Teaching and Learning at Brown University, based upon my experience as a TA for Prof. Susan Alcock's "Food and Drink in Classical Antiquity," an undergraduate course taught at Brown in 2009 and 2013. At Florida State University, I am slated to teach this course in Fall 2016. Eating is not, and never has been, a merely biological activity. interpret those synthesized data sets for a clear, well-articulated understanding of the importance of food in both the ancient and modern world as more than a biological necessity, but as an historically, culturally, and geographically contingent construction. Class meetings will revolve around lectures on the themes presented day-by-day in the syllabus. However, you are encouraged to ask questions and give comments if you have something relevant to say regarding the information! The reading responses will also provide a venue for you to voice your comments and questions; I will address these responses during the lecture. Powerpoint slides, images, and other supplementary material and resources such as the class bibliography will be posted to Blackboard for your reference. All written assignments will be submitted via Turnitin on the CLA4930 Blackboard site. Please see Turnitin for instructor feedback on written assignments, both in-line and as comments. Please come to class on time and ready to actively contribute to discussion by sharing your thoughts, comments, and/or questions in response to the readings and short assignment prompts. Attendance will be taken daily and, along with your class participation, will comprise 5% of your final grade. Quizzes: Occasional short, in-class quizzes will gauge your comprehension and reactions to the readings (especially the primary sources), previous material, and geography of the Mediterranean and its connections. These will likely take place once a week or every other week, without advance warning. Details of these assignments will be distributed as handouts in class. This 7-10 page paper, in the form of a comparative essay, will build upon the short assignment and subsequent discussion held in class. Details of content and format will be discussed in class and distributed as a handout two weeks before the due date. Papers will be evaluated according to the class rubric, available on the CLA4930 Blackboard site. Exams: Both the Midterm (15% of final grade) and Final (25% of final grade) exams will consist of multiple choice, short answer, short essay, slide IDs, passage IDs, and map location identification portions. These will follow the format of the in-class quiz questions, so that students have an idea of what to expect and how to prepare. Final Project: You will create an online exhibit/essay (equivalent to a 10-12 page research paper) documenting and interpreting food & drink objects, art, and texts from antiquity according to the Southeast Europe Digital Documentation (SEEDD) Project metadata schema. Group projects are dependent upon instructor approval. Papers will be evaluated according to the class rubric, available on the CLA4930 Blackboard site, as well as critical reception and revision according to instructor and peer feedback. Additional details of the individual elements will be distributed as handouts and discussed in class at least two weeks before each is due. Please see the Course Schedule on the CLA4930 Blackboard site for due dates. Thursday, September 1: What, when, and where is the ancient Mediterranean? Molleson (1994), "The Eloquent Bones of Abu Hureyra," Scientific American 271.2: 70-75. Cuneiform records of food distribution! Meet in the lower level of Strozier library for a hands-on experience with ancient Mesopotamian cuneiform tablets currently held in FSU Special Collections. DeFelice, John. 2007. "Inns and Taverns," in The World of Pompeii, ed. John J. Dobbins and Pedar W. Foss. New York: Routledge, 474-486. Fischler, Claude (2015) "Is Sharing Meals a Thing of the Past?" Cappellini and Parsons (2012) "Sharing the Meal: Food Consumption and Family Identity"